Samsung at CES 2018: 5 key highlights, from Bixby to 8K QLED TVs | What Hi-Fi? You can't help but be impressed on some level by the scale of a Samsung CES press conference, and there was once again no shortage of stage, screen, lights or lasers at the 2018 rendition. There were plenty of things Samsung wanted to talk about, too, even if it seemed a little light on concrete product announcements, notably when it comes to the audio and video side of things. This is perhaps in part because Samsung has such a huge range of products to cover during its 45-minute conference. Thankfully for Samsung, this was ultimately the company's underlying message - everything will talk to everything else, and in ever smarter ways. So from SmartThings to QLED, 8K to MicroLED, these are the Samsung CES 2018 highlights. No, Samsung hasn't had a sudden change of heart and announced an OLED TV. Instead, it's full steam ahead with QLED. And not just 4K QLED TVs, but the promise of 8K QLED TVs on sale by the end of 2018. Yes, we said 8K TV. The QLED technology has had some not insignificant upgrades, too, most notably bringing direct, local-dimming backlighting instead of edge-lit backlight, allowing the sets to reach a brightness of over 2000 nits. Ultimately, direct QLED should mean better contrast and deeper black levels. But for now, we await details of the full Samsung 2018 TV range. If you think 8K TV is a bit fanciful, what about a 146-inch modular TV, complete with a brand display tech (in name, at least)? Samsung is calling it, 'The Wall'. There's never any shortage of huge, headline-grabbing TVs, and Samsung threw another one into the mix with not only a monster screen, but the idea of modular TVs. The suggestion is your future TV could be made to your specific specification, which makes sense on paper, but sure sounds awful complicated, not to mention expensive in reality. But forget about that, this is CES! Modular TVs for everyone! How big do you want it? Samsung is very much still banging the drum for its digital assistant, Bixby, which will now find its way into your Samsung TV as well as your Samsung phone, tablet or smart speaker. The company's answer to Google Assistant or Amazon Alexa will allow you to control your TV by shouting from your sofa, in itself not a new concept, but will also bring the ability to do all sorts of more involved voice-activiated tasks, more commonly associated with smart speakers and phones. And it's not just TVs, Samsung also showed-off a 'smart fridge' complete with screen and built-in Bixby, so now you can ask who ate your leftover pizza and potentially get an answer... or maybe just check your schedule for the day and other more familiar voice-assistant tasks. 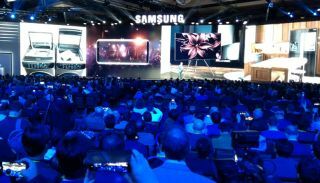 Samsung spent no short amount of time focusing on the push for ultimate connectvity across all Internet-enabled devices, aka the Internet of Things, which Samsung brands as SmartThings. Jumping from 'IoT Cloud', to 'SmartThings Cloud' to 'SmartThings Ecosystem' to the ultimate end game of 'Intelligence of Things' - coming by 2020, said Samsung - seemed a somewhat over-complicated way of highlighting how this thing will talk to that thing. Nevertheless, it seems this is a big focus for Samsung. And if any company has the range of products to really get to grips with how everything in your house could communicate seamlessly and usefully, it's Samsung. We'll watch this space. And Samsung isn't just focused on the home. Lest we forget, Samsung made the not insignificant acquisition of Harman back at the end of 2016. And we've seen various joint plays already, such as AKG earphones with Samsung phones. This CES saw the companies announce an in-car entertainment system, the world's first QLED in-car display, no less. Harman QLED Auto is a new generation of in-car display which uses the technology already found in Samsung's QLED televisions. The partnership will also see Harman offer transparent and flexible OLED displays to car manufacturers. An in-car screen that works as well as a phone and looks as good as a TV? We wouldn't say no.